This receiver needs to be purchased with caution as quality control leaves a lot to be desired, the year of manufacture has proven to be no guarantee of reliability or build quality. Universal Radio sell these radios and carefully inspect them for proper performance prior to sale, so buying from a firm with an identical sales strategy would be a wise decision. Happily, mine works perfectly, the RX audio is easy to listen to despite the fact that the internal speaker in not of the highest quality. However, when fed through my high quality PC sound system it sounds fantastic. I usually run the audio through my Datong FL3 where the auto and manual notch prove very useful as does the variable SSB filtering. The telescopic whip picks up quite a bit of hash from the LCD screen, most noticeable on 160m, an external HF antenna gives vastly superior performance as does a dedicated FM broadcast band antenna. A good quality digital filtered speaker cleans up the FM audio. Overall, I like the 800 quite a lot, it's no match for a TOR receiver but it has a charm all its own like an old vintage radio. Find a good one and it will wear the owner out. Estimating the value of a rig can be challenging. 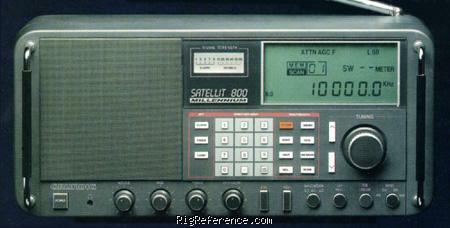 We collect prices paid by real hams over the years to help you estimate the current value of the Grundig Satellit 800. Just bought or sold this model? Let us know what you traded it for and help other ham operators!